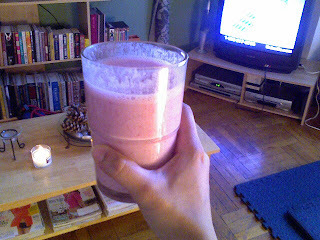 I am on a Strawberry kick this weekend....last night for dinner, I was planning to have left over tuna but instead I made a protein shake with Vanilla Light Muscle Milk and Strawberries with a side of Stacy Chips. 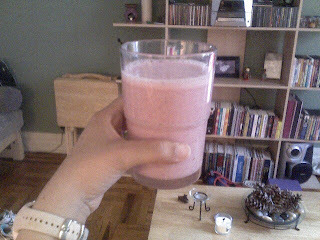 Before Yoga this morning, I made another Strawberry and Vanilla Protein shake since it tasted so yummy last night and I needed energy for class. Class was GREAT! My regular instructor was out and her friend was filling in and she was amazing. I really liked that she challenged us more and did a lot of various poses, it kept me on my "toes" (pun intended lol). I burned 219 calories in class and 316 calories walking there and back. 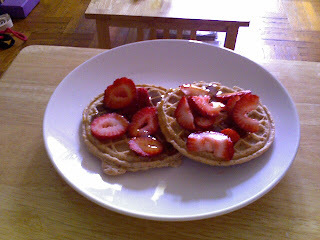 For Breakfast 2, I was still in the Strawberry mood so I had 2 Kashi Strawberry Waffles, with chopped Strawberries and Lite Syrup with my usual coffee. wow, everyone is in a waffle mood these days! 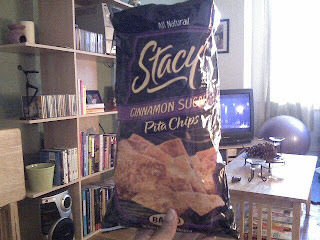 hee hee yum! Note to self: Find those waffles. And I love your strawberry kick!